This week I found myself at the Connected Communities: Connecting Epistemologies event to launch the report emanating from this six month AHRC-funded project led by five early career researchers (ECRs) across the UK: Helen Graham (University of Leeds), Katie Hill (Leeds Love It Share It), Peter Matthews (Heriot-Watt, now University of Stirling), Dave O’Brien (City University London, now Goldsmiths) and Mark Taylor (University of Manchester, now University of Sheffield). In addition to the five co-investigators, the project worked with eleven anonymous participants who contributed interviews, diaries, reflective texts, collages, maps (pictured) and even an original artwork to communicate the diversity of the lived experience of a Connected Communities ECR. As one of those participants, I identified with a number of general concerns, especially in the ‘what happens next?’ category of later career security and appropriateness. In the ‘now’, I have a very specific and unusual experience as a PhD student attached to a large-scale Connected Communities project. 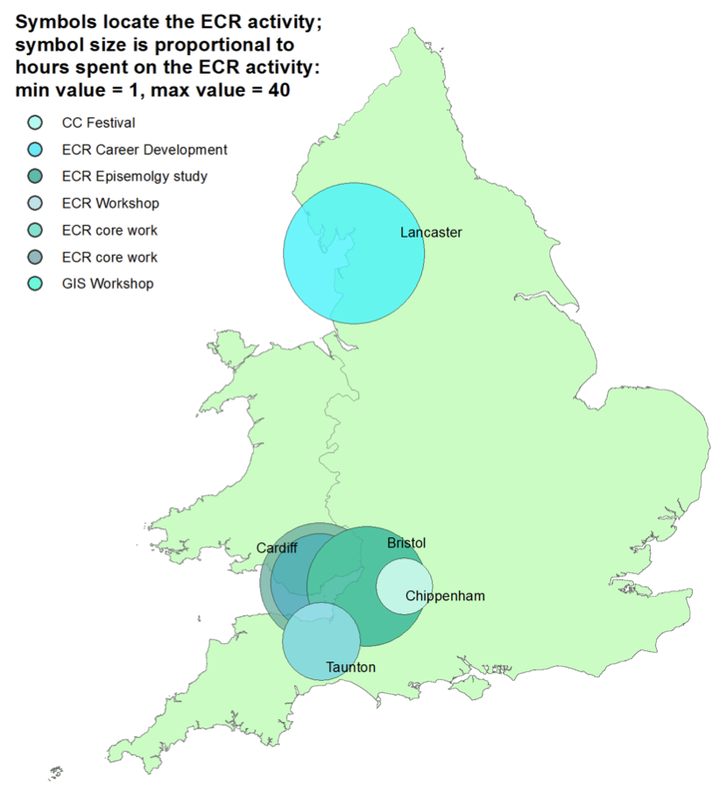 UEP is one the largest CC projects and involves staff across four universities undertaking embedded research in six ecosystems over five years, together with other sizeable undertakings using various forms of historical, textual, geographical and quantitative analyses. I happily outlined my positive experience of being on a team of such diverse, but skilled and generous people. 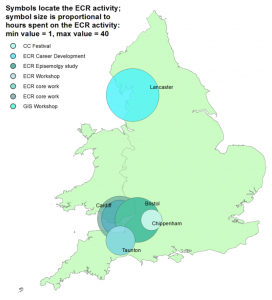 The support offered by my fellow team members, additional training and network opportunities presents a wealth of possibilities, but the uncertainty of interdisciplinarity felt across the ECRs reflects my own concerns regarding identifying with a particular discipline, and what this means in terms of a future in the academy. A response on Twitter suggested that the project perhaps came across to some as a bit of a whinge bag of how difficult it is to be an ECR on the margins of the academy. While concerns for the emergent practitioner were important for the project team, this was not the driving force behind the project or my experience of participating. I feel the project (alongside the other two papers presented at the event from Bryony Enright and Sue Harvey) offers a valid contribution to understanding some of the exogenous ‘benefits’ of a large scale funding programme like Connected Communities. The programme has arguably already created a research ‘culture’ in which new possibilities of flexibility and entrepreneurship for the research academic are felt possible in new ways. For the Connected Communities research aims, understanding the mobilities and inequalities across this evolving community is not only of interest, but vital, as early career researchers become ever-closer to the subjects in the harsh realities and uncertain futures of the increasingly neo-liberal university. This entry was posted in Uncategorized and tagged AHRC, Connected Communities, early career researcher, ecr, neo-liberal university, PhD, research community by Susan Oman. Bookmark the permalink.